So, have you guess the name of the musician I'm talking about? I think it's fairly obvious cause his name appeared the most than others, yup it's the one and only: Tetsuya Takeda-sensei. Kaientai is his group as well for those who doesn't know... ^^. Sensei is a veteran in Japan's music industry, a folk singer as well as a well known actor, with a TV Series in TBS that has been running from 1979 to 2011. I know what you're thinking, it's the same as mine: Wow... the show's even OLDER than me! Hahaha... One of his memorable role for me (which I just realized upon looking at the J-Drama Wiki, was a tv series when he played a middle-aged man who had failed matchmaking for 99 times, cause he's not smart or rich, finally struggling to make his 100 o-miai to be his last, while the woman he fell in love was deeply content by her deceased lover. It was very a touching drama, and I still remember that drama, especially the theme song "SAY YES" performed by Chage & Aska. Now on to today's song. 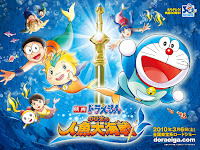 Is this song attached to Doraemon as well? 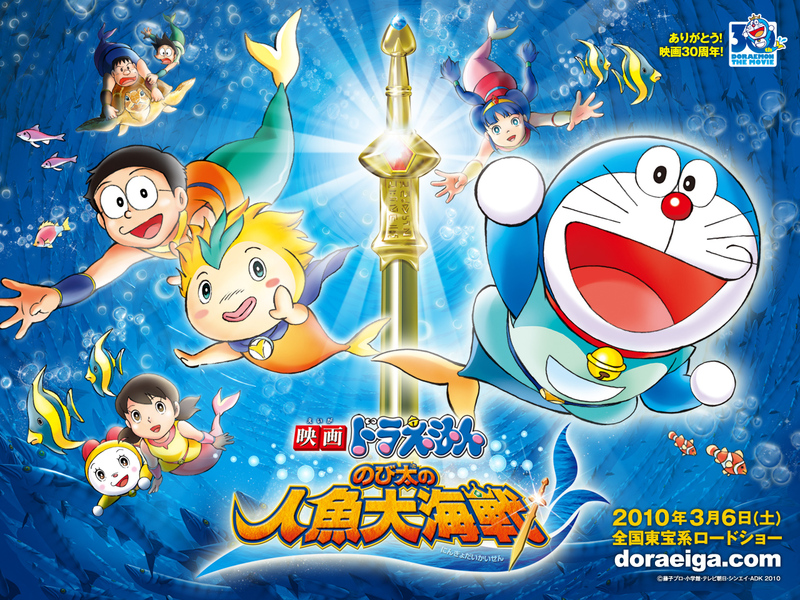 Yup, this song that I've actually covered since September, is played as the insert song for last year's Movie that featured the journey of Doraemon, Nobita and the gang when they met Sophia, the princess of the mermaids. The song was played as the gang enjoyed their playfull times on the sea, as they headed towards the mermaid land -Sophia's home. It's a very gentle and relaxing song, and will surely make you feel tender and emotionally attached to the scenes. Why do I kept saying 'emotionally' about Takeda-sensei's songs? Because they were more than just songs, they were more like poetry. Takeda-sensei wrote the lyrics as if he's rhyming a poem, and of course, by that he spoke a lot about his personal experience or memories through his songs. Lots of his lyrics are viewed from the eye of a boy, hence it fits so much to Nobita and Doraemon. I don't know how the movie relates to its MANGA (in which one released first), but these lyrics were always found in the manga version of the movie, since well... it really depicted so much of the story being told. This particular song, eventhough it might have felt like a love song at first (because the lyrics might sound cheesy)... it eventually described a memory about a boy playing in the beach, with his special person: his mother. Yes, somehow Takeda-sensei is singing from a man point of view, who recalls his precious time at the beach with his mother. He said, her tears are like the waves, her fingertips are like the shells... and he wished to experience that precious moments once again. It's a lovely song, mild and gentle about precious childhood memories yet it can also be sad and sentimental in a way that probably his mother has gone to heaven and not around anymore. I loved the music that actually sounded 'classic-japanese' for me, which obviously fits his vocal character, and the atmosphere of the anime. The single of this song, has a drama track in which he narrated the story of the song. I haven't had time to listen to it, but I'll do it in the near future. 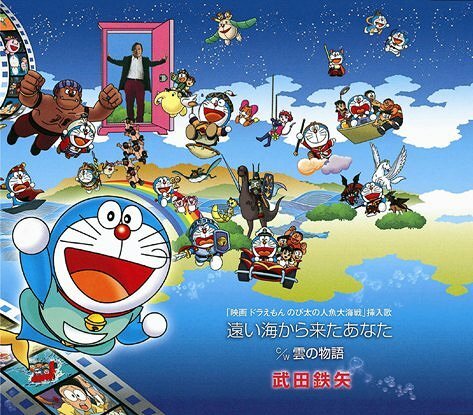 I learned about this song when I was looking for another Doraemon song to cover (I've done 2 movie theme songs). I fell in love with this song the first time I heard it, and basically decided to cover it right away. The biggest problem I faced was the fact that... I CAN'T FIND THE LYRICS ANYWHERE on the web!! How could I do a cover without the lyrics?! Aarrgghhh... I was actually quite frustrated at that time, cause I've like googled for hundred of sites but never found what I was looking for... (I do however got several of other movie themes instead hahaha) I finally decided to plug in my headphones, and started playing the song while typing the lyrics. So I relied on my hearing to catch the lyrics... GANBARU YO ORE!! Hahaha. Thankfully, since Takeda-sensei is a professional and veteran musician, his articulation was very clear that I probably only missed one or two words. So I did my recording with that lyrics, and was thrilled to be able to sing such a wonderful song. The numerous re-play times to catch the lyric resulted that I basically had memorized the music as well, so I had no trouble in the recording process. The cover was finalized, and I captured some scenes from the movie to put in the video, and finalized the video as well. But it was still CLAMP's month, so I couldn't post it yet... so did last month, cause it's SakuTai's month, hence I still couldn't post it... well, until now... HOOORAAY!!! 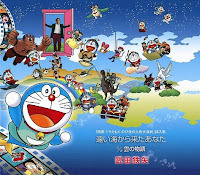 Look forward for more Doraemon songs, as well as Takeda-sensei's music in the future, cause I've already prepared for another of his work from this franchise as well.... Till then, hope you have a blast today, and see you again! Copyright 2011 - The Musics of Furede Riko All Rights Reserved.